Sixteen input recorder for TVI, AHD, IP (2 cameras) and Analog, 1 audio in, 1 audio out, 2 SATA HDD connections with up to 2 6TB, maximum 12TB combined capability, HDMI and VGA outputs. This XDVR is designed to provide the ability to quickly and easily play and store digital CCTV recording footage. With 24 to 32 channels, this is a great fit for office spaces, warehouses, and public spaces where a variety of cameras need to be monitored. Featuring H.265+ Pro and full channel recording at 8 MP, clear and usable footage is stored for your conveience. A rugged physical design, and RAID storage capabilities ensure that the footage will be protected and available. Four input recorder for TVI, AHD, IP (1 camera) and Analog, 1 audio in, 1 audio out, 1 SATA HDD connection with up to 6TB capability, HDMI and VGA outputs. 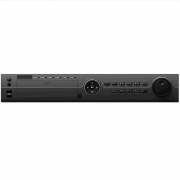 Eight input recorder for TVI, AHD, IP (2 cameras) and Analog, 1 audio in, 1 audio out, 1 SATA HDD connection with up to 6TB capability, HDMI and VGA outputs.